Magic: The Gathering Arena is the venerable card game’s new entry into the digital space, and the free-to-play game is finally in open beta on PC after several months of closed beta. I’ve been playing it for those several months. I have some opinions. If you aren’t aware of Magic: The Gathering, it is a card game where players pretend to be wizards who summon creatures and sling spells at each other. Originally released in 1993, the game is notable for being both compelling to play and very difficult to learn. 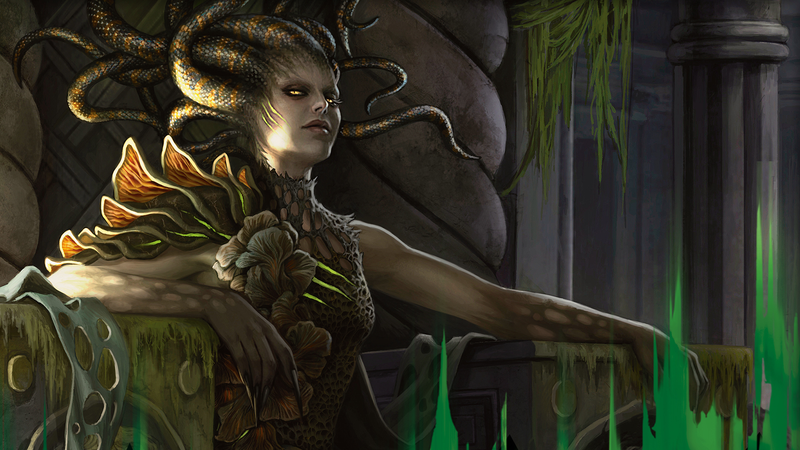 Magic: The Gathering Arena steps in here to take care of all that complexity for you. It keeps the stuff that makes Magic a unique game while jettisoning the immense mental load that often gets in the way of pretending that you’re a wizard, and it is a surprisingly smooth way to play the game. Arena is aware that one of the pitfalls of Magic is learning to play the game, and when you open the beta and create an account you are treated to a pretty good tutorial that walks you through how it works. The tutorial for Arena spends most of its time getting you acclimated to how the general flow of the game goes, with its turn order and the phases of those turns, and as a player with more than a decade of experience trying to teach other people the game, I appreciate the clarity of that tutorial. Beyond that, Arena doesn’t hold a player’s hand. It guides you to a menu where you can play “ladder” matches, and it also forces you to use some of your starting account gold to buy a pack of cards (I hate this, despite understanding why you would want to educate players on how to buy cards). After that, you’re free to play digital Magic to your heart’s content with the knowledge you’ve built. You can do daily quests, win packs of cards, grow your collection, and use that collection to play the game. Bing bang boom. This is a screenshot of me winning a game of Arena with my slightly-improved beginner deck. It is unclear to me, though, what someone who does not already have an investment in Magic would do here. The game gives you a few single-color starter decks to play matches with in the beginning, but they’re all very weak and lack any kind of unifying strategy other than “play the cards in your hand.” You can unlock new decks by accomplishing different quests, but what incentive does a new player have to actually play enough games to make that happen? It is currently unclear to me what the path from being a completely new Arena player with no experience to an enfranchised, experienced player looks like. Perhaps the Arena designers are simply expecting the fan community and content producers to pick up that slack, and if so, then there should probably be some in-game pathway to direct new players to endorsed sources of information to show what high-level, experienced play is. It is currently unclear to me what the path from being a completely new Arena player with no experience to an enfranchised, experienced player looks like. For example, there’s currently no robust explanation or informational links in Arena to show players how to build a deck. There are land count suggestions and there are tooltips in loading screens, but there is no educational material that states why you might want to have X number of spells or Y number of creatures. While an experienced player is always going to have opinions here, and consensus in Magic always seems to follow whatever a pro player said in an article last week, it would be nice to have videos or accessible links in the actual game application that takes new players to resources that can help them be better at the game. Otherwise, it is setting new players up to be completely smashed into the dirt over and over again until they bootstrap themselves out of their nightmare loss streak. That doesn’t seem super fun to me, and I think it will probably churn a lot of excited but inexperienced players out of the game. Another potential pitfall for new players is the “wild card” system. Opening packs can give you wild cards of different rarities that can be transformed into a card of that rarity. So, for example, an uncommon wild card can become any uncommon Magic card by expending it in the card collection menu. And, of course, you cannot play a card if it is not in your collection, so you want to use these wild cards to get your full playsets of four cards. If I use all of my wild cards to get four of a bad card, and I realize it immediately in the first game that I play with those cards, then I am being punished for experimenting and trying to be creative. In this scenario, I have used my wild cards “wrong” in the sense that I have created four useless cards. That happens when we play with physical cards, of course, but in physical Magic I did not lose a valuable resource that is hard to get in order to experiment with deckbuilding. Four of a given uncommon in paper Magic is going to be less than a dollar; in Arena, four uncommon wild cards are only accrued over hours of game time. This means that there is a heavy opportunity cost for expending resources to see if a card you are unfamiliar with might be fun to play with or build a deck around. It makes for a play space in which using your wild cards as conservatively as possible to create “sure bet” decks is the only strategy that doesn’t punish you, and I’m not sure that makes for an exciting or fulfilling play environment. In any case, it creates a different kind of constraint than exists in paper Magic, and I am interested in what the play experience looks like over the remainder of the beta period. If you’re an experienced player, though, Arena is already an excellent game for you, especially if you want to play digital Magic and do not want to deal with the terrible Magic Online. If you already understand how to build decks or find decks online and then replicate them, then you’re going to jump right in and have a good time. In fact, as a player who tends to enjoy Limited formats more than Constructed ones, Arena is amazing for me. I have drafted many, many times over the course of the Arena beta, and it has been a clean and easy process that delivered all the fun of the format without having to leave my chair. While a real-life draft is going to involve eight players passing cards back and forth in a circle, Arena handles draft by putting the player up against AI drafters who pick cards out of each pack. Sometimes this AI makes truly bewildering decisions, but honestly it is not that much different than playing with a group of players at mixed experience levels at a local shop. There are “competitive” events in the game, which follow a traditional best-of-three format that Magic uses in all official matches, and then more casual single game matches for all of the other events. For a digital game, I prefer the latter, and in those you play either until you get three losses or seven wins. If you’re a kind of person who cares about economics in digital card games, here you go: You can enter the events of Arena by spending either gold or gems. Gold is earned through the completion of in-game quests, and gems are either purchased with money or earned as prize winnings for events. To give you a sense of the range of conversion, you can enter a Magic 2019 draft right now for either 5,000 gold or 750 gems. You can purchase 750 gems in the Arena store for $4.99. So, by this equivalency, 1,000 gold is roughly equivalent to $1. To get your entrance fee of 750 gems back from a draft, you have to win at least six games. Five games gets you 650 gems in your prize winnings, but six games gets you 850 gems, meaning that there’s no exact equivalency. However, no matter how many games you win, you always get a pack as prize winnings, and a single pack would cost 200 gems if you could buy a single pack (you cannot, you can only buy three packs for 600 gems.) All of this is confusing and labyrinthine, and I am sure that some spreadsheet has spit this out as the exact correct payout for Wizards of the Coast to make X amount of free-to-play profit off of each player. Personally, over the course of an entire summer of extensive beta play, I have never run out of gems or gold. I am good enough at the game that I can generally get my entry fee back, and if I don’t get it back, then I can get somewhere close enough. I bit the bullet and put $20 into the game when the open beta launched earlier this week, and I am still coasting at a high total after I played some sealed events and drafts. That said, I have also been playing the game for more than a decade, and it is hard to know if that would be a new player’s experience of the digital economy. It can be hard to learn a game when losing it becomes a financial drain. Arena is currently an excellent adaptation of Magic: The Gathering into the digital space. It shares all of the problems that Hearthstone or Eternal has when it comes to economics and onboarding new players. For experienced players who want quick and easy access to Magic, Arena is a boon. Although I selfishly want older formats like Modern or Legacy implemented into the game (or Cube drafting! ), I understand that the complexity of adapting some of those older cards to Arena might be very high. I guess I can always head over to Magic Online for that kind of thing. With all of that said, Arena is in a great place currently. I think it can only get better from here, and I’m hoping that the Arena development team does the work to make sure that it becomes accessible and affordable for as broad a range of players as possible. Update - 2:50pm: This game is for PC, and we’ve clarified that at the top of the post.